Pictured here (left to right) are SUMC Coat Ministry Co-Chairs Jim Fisher and Mary Ann Warman, with Northern Rehab’s Deb Loitz. We held our annual 2018 community collection of winter coats and accessories for the Sycamore United Methodist Church (SUMC) Coat Ministry for. A very large donation of coats, boots, scarves, hats and mittens were recently delivered. “We are so glad to partner with the SUMC Coat Ministry each year. This was our most successful drive to date. We dropped off donations four times during the drive and are very thankful to our community for so many coats and winter items that were donated! We must have had over 150 coats or more plus a lot of mittens, scarves, hats and boots. 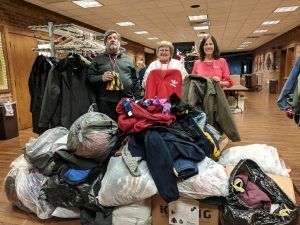 Northern Rehab strives to support the needs in our community and enjoys hosting this coat drive in order to help keep those in need warm each winter,” comments Northern Rehab’s Director of Community Relations Deb Loitz. The SUMC Coat Ministry is open every Monday from 12:00 noon to 4:00 pm during Food Pantry hours at the church located at 160 Johnson Avenue in Sycamore. For more information about Sycamore United Methodist Church, the Coat Ministry, Food Pantry, or other information, please visit their web site at: www.sycamoreumc.org or call 815.895.9113. Northern Rehab extends our gratitude to all of the community members that generously donated winter items in support of the SUMC Coat Ministry. Thank you to everyone that generously donated to this cause!